In an ongoing theme of tip suggestions from Google, I got one from my Google keyword searches. So, on your right you can see how you can close the shapes window in the upper right corner. See that “x” up there? Now, why would you ever want to do this? I’m not entirely sure. You’re using Visio for the shapes, aren’t you? Love your stencils, and they’ll love you back. Maybe you were looking for more of a full-screen / F5 experience? At this point, you’ve lost your shapes window and now want it back? 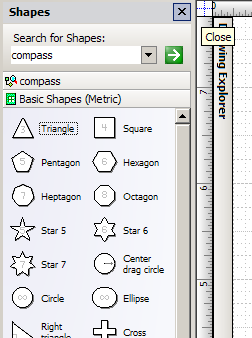 View > Shapes Window (it’s even the first option).